Konica Gunners may be new to the local five-a-side football scene but their 'golden oldies' have already made their presence felt. 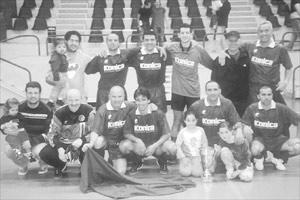 Relying on a team brimming with former Malta stalwarts like Carmel Busuttil, John Buttigieg, Silvio Vella, Ray Farrugia and Martin Gregory, Konica Gunners enjoyed a very successful debut in the Malta FA-organised Futsal League, winning the Third Division Section A and the KO competition which was contested by teams from all divisions. Konica Gunners played 15 games, winning 13 and drawing the other two to finish as the only unbeaten side in their category. Their league championship was sealed in March by virtue of a 3-3 draw in a decisive clash with direct contenders Southenders. Busuttil, Malta's assistant-coach, topped the Division Three scoring charts with 26 goals. In the KO, Buzu and company reached the final after ousting Seven 6-3, Division One champions RBSM 4-2, Swing Kids 8-4 and Amazon FC 9-2 respectively. The final was contested between Konica Gunners and the highly-rated Hibernians. True to expectation, the game turned out to be an exciting affair with the Gunners, who had Konica Minolta office equipment as their main sponsors, prevailing over their more-experienced opponents 6-4 after extra time. At the end of the match, played at the Hibernians Pavilion, the KO Cup was presented to Anthony Farrugia, the Gunners goalkeeper. Konica Gunners' (konicagunnersfc@yahoo.com) 2003-2004 - Anthony Farrugia, Adrian Caruana (goalkeepers); Carmel Busuttil, Silvio Vella, John Buttigieg, Marko Glumac, Ray Farrugia, Martin Gregory, Aaron Micallef, Raphael Psaila, Oliver Mallia, Silvan Borg, Alexander Mizzi, Robert Micallef (coach). Anthony Micallef is the club president.